The result of the Syrian crisis is likely to affect Russia’s positions in the world and influence in the Middle East. At the same time, accounts of Chechens participating in the Syrian war increase the potential risks for Russia at home. The outcome of the Syrian civil war will obviously have an impact on Russia’s standing in the world and influence in the Middle East, not least as it has staked so much credibility on supporting Bashar al-Assad. However, accounts of Chechens taking part in the insurgency also highlight the potential risks for Russia at home. Last year, reports began circulating that there were Chechens among the several thousand foreign fighters struggling against the Syrian regime. The hard evidence was limited, though, and seemed to suggest only a handful. Furthermore, there was nothing to prove that they were not locals. Syria has a population of perhaps 20,000 ethnic Chechens. Given that they are mainly Sunnis, many have no reason to favor Assad’s Alawite regime. After all, the Chechens have become popular folk devils for Russians and some Westerners alike, with journalists and analysts eager to see their hand in everything from organized crime to terrorism. It was easy to ignore or disbelieve these accounts. Indeed, they were almost certainly alarmist exaggerations. Since then, though, three things have begun to become clear, all of which have worrying implications for both Russia and also the rebels’ Western backers and many of their regional supporters. The first is that there indeed appears to be a growing number of Chechens within the rebel movement, including many from the North Caucasus. According to some within the movement, the North Caucasus is second only to Libya as a source of foreign fighters, although many were expatriates studying at religious schools outside Russia. The second is that these Chechens are disproportionately drawn to the more radical, ultra-Islamist rebel factions. The Al-Nusra Front, a rebel unit that the U.S. government has designated a terrorist Al-Qaeda organization, numbers several within its ranks. Its leader, known as Abu Mohammad al-Golani, may come from the Syrian Chechen community evicted by Israel from the Golan Heights. More directly, the so-called ‘Immigrant Brothers’ is a force drawn purely from expatriate jihadist fighters and it is commanded by a Chechen known as Omar Abu al-Chechen. Third, and most worrying, is that many of these jihadists see Syria as just one more battlefield in a global struggle. Rather than just fighting to bring down the Assad regime, they see this as a means to create an Islamic state which could then be the base for future operations. As a result, despite the enthusiasm and experience of many of these volunteers, Brigadier Selim Idris, the rebel Free Syrian Army’s chief of staff, has begun trying to discourage them from coming. He appealed for them to remain home and “just send us weapons or funding or even pray for us,” precisely because these tend to be jihadists, whose presence complicates the rebels’ relationship with Western backers. Their presence attests to the growing rift within the opposition between moderate and ultra-Islamist elements, as well as between Sunni and Shia extremists. It also raises the question of where these fighters will go once the war in Syria is over. The presence of Libyans in Syria emphasizes the rise of a “jihadist international” willing to travel from hotspot to hotspot in the name of the cause. This is not new. From its nationalist beginnings, the conflict in Chechnya had acquired an increasingly jihadist dimension from the later 1990s. Foreign warlords such as the Saudi-born Ibn al-Khattab and Abu Omar al-Saif became key figures in the conflict and Al-Qaeda representatives such as Haled Yusef Muhammad al Emirat, known as Moganned, funded rebel commanders friendly to their cause. All three men are now dead and the center of gravity within the insurgency has moved out of Chechnya, into Dagestan and Ingushetia. Here the anti-government gangs, the jamaats, remain essentially nationalist, uninterested in the wider politics of global jihad. Doku Umarov, self-proclaimed head of the “Caucasus Emirate,” claims overall command, but his authority is distinctly limited. However, an advent of veteran fighters from Syria, both Chechens and allies from other battlefields, backed by new funds and weapons, might again shift the balance. Umarov is a jihadist, and he has publicly backed the Syrian revolution. He would likely be the beneficiary of any such influx, which could help galvanize his moribund war and further radicalize the North Caucasus insurgency. While the Russian authorities will clearly do what they can to prevent this, securing the North Caucasus border has proved problematic. Ironically enough, this gives Moscow a reason to hope the fighting in Syria drags on, including the probably inevitable civil war which would follow the regime’s fall. 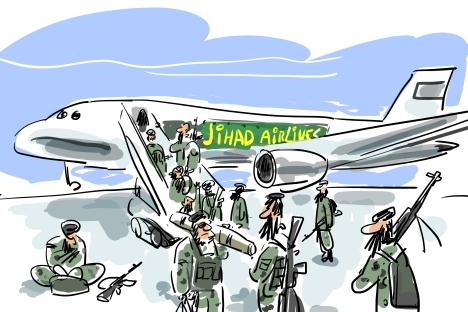 Once it is over, after all, there is a chance the forces of the “jihadist international” will return home. Mark Galeotti is Professor of Global Affairs at New York University. His blog, ‘In Moscow’s Shadows,’ can be read here.